Ravi has been involved with the communications IC industry for 20 years, spanning executive, R&D, marketing, and entrepreneurial roles. Companies include TCSI, AT&T Bell Laboratories, Synopsys & Berkeley Design Automation. Ravi has been named to RutbergCo’s Wireless Influencers list every year since 2006- the list cites the 200 people with the greatest influence on the wireless industry. He is also a Charter Member of TiE (The Indus Entrepreneurs), a non-profit global network of entrepreneurs and professionals, established to foster entrepreneurship and nurture entrepreneurs. 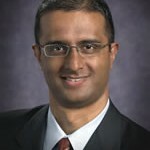 In April 2010, Ravi was elected to the EDA Consortium (EDAC) Board of Directors for the 2010-2012 Term. Ravi received his BSEE (honors) from the California Institute of Technology and his Ph.D. in EECS from the University of California at Berkeley, where he was a recipient of the prestigious UC Regent’s Fellowship. Colin has more than 25 years of experience in the semiconductor and systems market related to the wireless communications industry. Colin was CEO of Artimi and was V.P. marketing and business development at Atheros, where he was part of the team that took the company public in 2004. Colin has also been CEO of Morphics Technology, Inc. & BMA Communications and earlier in his career Colin held engineering and management positions at Xircom, GEC Plessey, Linear Technology and Analog Devices. Colin holds a bachelor’s degree in electronic engineering from the University of Glasgow, Scotland.